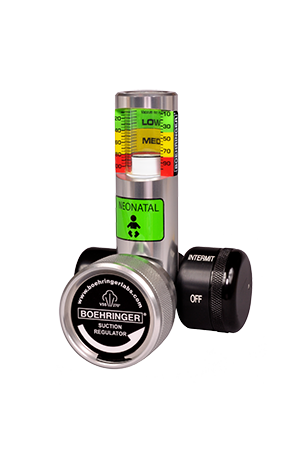 The Neonatal Suction Regulators are specifically designed for Neonatal and Pediatric applications requiring continuous and intermittent suction. Almost all of the clinical recommendations for suction for this patient population are less than 100 mmHg. The 3814 has been specifically designed to facilitate safe suction for this patient population. It is easy to see it is made for babies because it has a visible baby on the front, so we don't lose them within our hospital. Appropriate for hospital-wide use for suction therapy procedures including closed suction, deep suction and oral care. Areas of use include: Critical Care, Emergency Room, and Inpatient Acute Care of Pediatric and Neonatal patients requiring Continuous or Intermitting suction.